Competition has been postponed. Dates for the competition will be announced soon! We deeply apologise to everyone. Then Idea to Product Competition Latin America is the opportunity you have been looking for. The Centro de Empreendedorismo e Novos Negócios of Fundação Getulio Vargas – FGVcenn will promote in 2016 the 9th edition of the Idea-to-Product Competition – Latin America. The Idea to Product® Competitions, founded at The University of Texas at Austin, are early-stage technology commercialization plan competitions that aim for unique product ideas with clear market demand that use innovative technologies. The goal is educating and developing the next generation of technology entrepreneurs. The program is particularly interested in matching technologies resulting from a university’s fundamental research programs with potential markets. The winning team will be automatically invited to participate in the Idea-to-Product Global, with the winners from others local competitions. The Latin American contest wishes to bring to Brazil a representative from each of the most important schools from all 33 countries in the region. I2P winning team, EbergyRubb, with judges Luiz Langbeck (3M), Nádia Barbosa Raposo (UFJF), Marina Adami (Grupo Boticário) and Marcelo Tambascia (3M), and competition director, Rene Fernandes (FGV). 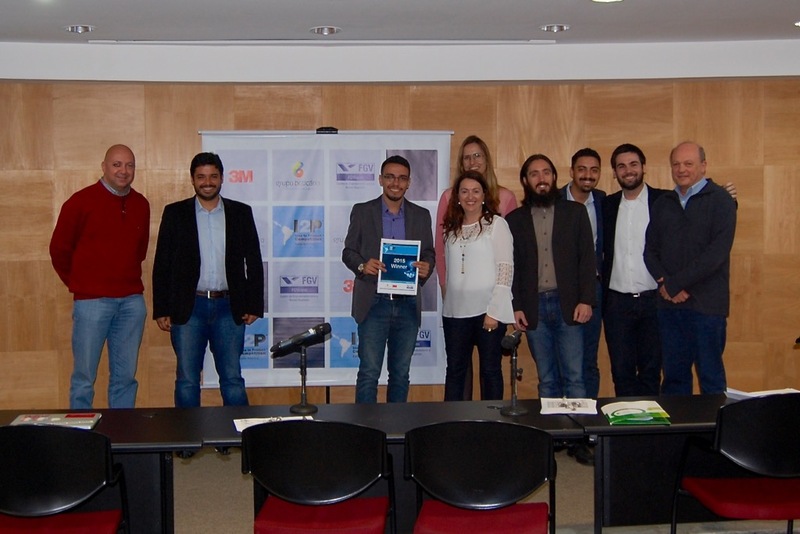 Sao Paulo, August 29th, 2015 – EnergyRubb, from UFMG, was the winning team for the 2015 Idea to Product Competition – Latin America. The EnergyRubb is a company that generates energy from polymeric waste using a Self-Sustainable Pyrolysis technology (SSP) developed by itself. The SSP technology is able to get liquid fuels that are used to generate electricity and be mixture with diesel. In addition, other raw materials are obtained (carbon black), which are used in the metallurgical and polymers industry. Unlike companies that carry out disposal or recycling of polymeric waste, EnergyRubb uses all energetic potential of this waste. As a result, our customers can minimize disposal costs as well as saving in energy costs, making them more independent of energy companies.